In the end, crews battled and made quick work of it – getting it out within an hour. Chief Len Albanese said it is still under investigation this week, and that it was a total loss. There were no civilian injuries, but one firefighter was injured. 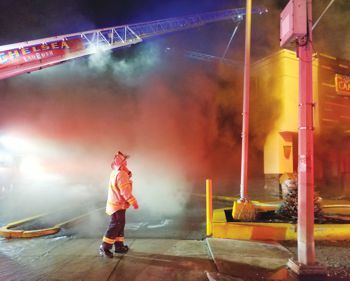 The Boston Sparks Club under the command of President Paul Boudreau responded to the scene supplying Re-Hab and refreshments for the firefighters. Chelsea Police also provided traffic and crowd control during fire. Crews from Medford and Boston provided mutual aid during the fire. City Manager Tom Ambrosino has requested the Council to fund the demolition of the burnt-out home at 80 Warren Ave. that was the site of a domestic shooting incident and raging fire in May 22, 2017. The home has sat in its burnt out condition for more than a year, mostly due to tie-ups in the court system due to a dispute by the owner and the insurance company. In that time, neighbors have had to see it as a reminder day in and day out of the chaos that ensued on that spring night. Now, Ambrosino is asking for a supplemental appropriation from the Stabilization Fund in the amount of $25,000 to demolish the home. The owner, he said, doesn’t have the funds to tear down the home. So, the City will tear it down, secure it, and then seek to be reimbursed at a later date. On May 22, 2017, a man in the home shot at his 10-year-old daughter and wife, chasing them to a neighbor’s home where they sought shelter. After that, police were alerted and the man barricaded himself in the home. He then set a massive fire in the home and began shooting at police and firefighters. Police did shoot the man and the fire consumed the structure. There was a massive police and fire presence at the scene. The Council is expected to address the request on Monday, Sept. 24. After a packed meeting last Wednesday, Jan. 24, project managers for the state Department of Transportation (MassDOT) said they are reconsidering a recommendation to eliminate the 5th Street onramp as part of the overall three-year Chelsea Viaduct Rehabilitation project. Joseph Pavao, project manager, said a consultant for MassDOT told them it was believed the onramp could be eliminated. It was believed that the Everett Street ramp and Cottage Street ramp could absorb the traffic. However, Pavao said they have heard loud and clear from the community that it might not be popular. He did say they would definitely be closing the 5th Street onramp at least temporarily for about three or four months in 2020 during the repairs to the superstructure of the Viaduct. Beyond that, though, they are reconsidering the original plan to fully discontinue it. That reconsideration came chiefly from Councilor Roy Avellaneda and other elected officials and business leaders that sounded off late last year when it was first reported that the ramp might close. Concerns about traffic coming down Broadway and further clogging Everett Avenue were chief among the comments. Pavao said they have met with City Manager Tom Ambrosino recently about a mitigation package that was presented to MassDOT late last year. He also said that he hopes to be on the agenda of the next Chelsea City Council meeting to present an official mitigation plan for the project. The project is now at 25 percent design, and they are hoping to advance it to a final design very soon. He said they hope to have it advertised to bidders this spring. “We want to advertise this for bids in late March or early April,” he said. The project includes fixing about 260,000 sq. ft. of structurally deficient decking and superstructure. It doesn’t mean those portions of the viaduct are unsafe, but they certainly need to be repaired. The project also includes work on the structure below the bridge, improving lighting, improving drainage and making parking lot improvements under the bridge. They hope to have a contractor on board soon and potentially start in October 2018. The majority of the work will begin in 2019, and that will be on the underneath of the bridge and won’t impact Rt. 1 traffic. In 2020, that’s when the superstructure work will begin and that will be very cumbersome for traffic. “That’s when we’ll have permanent lane reductions to two lanes in both directions,” he said. He said they will use accelerated bridge repair techniques, and they will work 12 weekends (55 hours each weekend) during the project. It is slated to end in early 2021 with paving and small items. 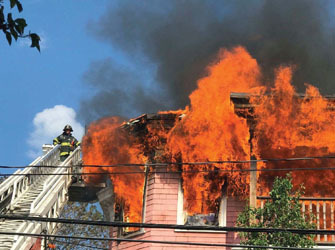 At 4:38 p.m. on May 19, Chelsea Fire received a call for a house fire at 127 Shurtleff St. Upon arrival, heavy fire was showing from the 3rd floor with exposure buildings in close proximity on each side. Deputy Chief Robert Houghton transmitted the working fire and struck the second alarm. Fire quickly spread to the 3rd floor porch and cockloft area. Major flames erupted from this fire at a home on Shurtleff Street May 19. Firefighters mounted and aggressive attack, and a third alarm was struck for additional manpower. Searches of the building were negative with occupants self-evacuating. There were no civilian injuries. Three fire fighters were injured battling the blaze, none of which were life threatening. Overall 16 occupants were displaced and being assisted by the Red Cross. The fire was contained to the third floor of the structure of origin. None of the exposure buildings were affected. The cause of the fire was electrical. An air conditioning unit was being energized using several extension cords.